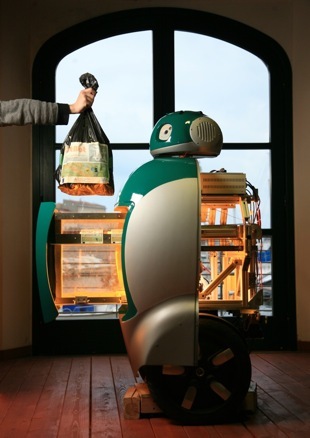 Assuming you are European and never have more than a head-sized bag of garbage to throw away, this Dustbot appears to be the perfect trash-related companion. I believe the idea is that an army of these things will lurk in every city and constantly collect garbage, eliminating the need for garbage trucks to come to every home. It navigates via GPS and can be summoned by a text message — sounds like some people I know. It’s essentially a Segway with a trash compactor on top, driving on a wire, but that’s still pretty awesome. Although it was designed and built for Italian cities (those narrow streets are murder for garbage trucks), the obvious application is Japan. They love this stuff, and I can’t believe it wasn’t invented there first. There’s plenty more pics and video at the Dustbot site, though it’s mostly in Italian and some of the huuuge pictures download at less than 10KB/sec. Come on.